A pergola is sometimes called an arbor or an open gazebo. Its classic design consists of a decorative overhead lattice supported by pillars for an airy, open-roof shade. Pergolas serve as architectural statements to your home while making the outdoor living spaces more cozy and comfortable. Pergolas are also used as transition points from one part of your garden or yard to the next. It also serves as defining lines between different outdoor living spaces like outdoor kitchens, outdoor dining area, or patio. 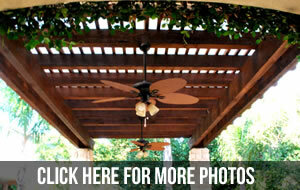 In Houston pergolas are one of the best ways to create an additional outdoor room. Whether you have an uptown haven or a rustic veranda, installing a pergola is a definite plus to your home’s value since it increases the floor space of your Houston home. Patio Creations can help you create the pergola Houston residents will admire and one that reflects your own personality and style. In addition to our Houston pergolas, arbors and gazebos, Creative Patios also designs and installs screened patios and decks, porches, patio covers, and many other types of outdoor living spaces. Visit our Houston office or contact us to schedule a free in-home estimate and no-obligation design consultation.